If you know how to use a wrench, then you can easily learn how to adjust the cutting deck of a lawn mower. The lawn mower cutting deck contains the blades. 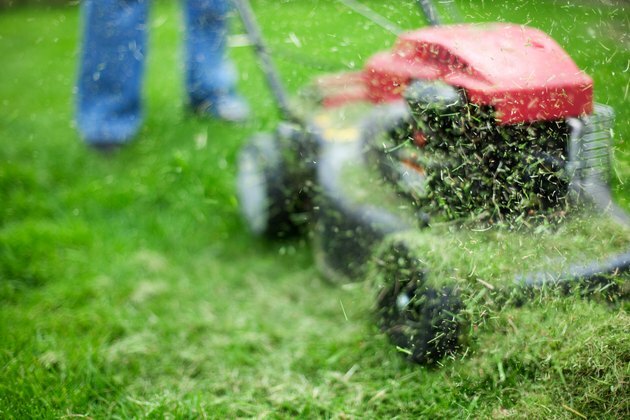 By lowering or raising the deck or blades, you can cut your grass shorter or longer. You will know you need to adjust your lawn mower's cutting deck if your lawn looks like it has an uneven cut. When the cutting deck is out of alignment, one side will cut the grass shorter than the other side. As you make passes back and forth over the lawn, the height difference will become increasingly evident. Other reasons why you may need to adjust the cutting deck on your lawn mower pertain to the type of grass on your lawn, the time of year and the current length of the grass. For example, tall Fescue should be cut to about 3 inches, whereas the recommended cutting height for Bentgrass is around half an inch. Even if you're not sure what type of grass makes up your lawn, if it looks brown or white after cutting, you should raise the height of your lawn mower's cutting deck. The lawn will not only look greener after cutting, but the grass will remain healthier. Grass growing in shade should also be cut taller, as should all grasses during a dry spell or late in the growing season. Finally, if the grass has grown quite long already, it's wise to raise the cutting deck to avoid overwhelming the mower and clogging the blades. Always make adjustments with the lawn mower turned off. Walk-behind mowers typically have levers next to their wheels that allow you to easily raise the cutting deck without any tools. Push the lever toward the wheel to unlock it, then slide it to the height you'd like. Lock the lever back into place by pushing it away from the wheel. Repeat with all of the levers on all of the wheels, taking care to set each lever on the same height to avoid an uneven cut. Note that some models may have adjustment levers on only two wheels, not all four. 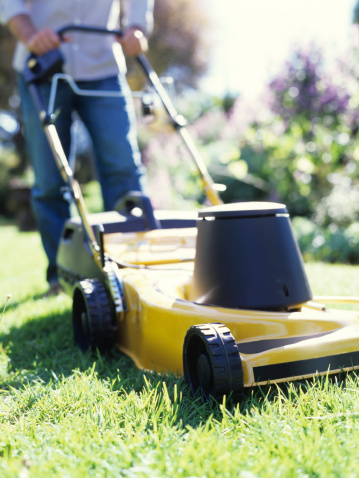 To adjust the cutting deck of a riding lawn mower, park it on a flat, level surface and turn it off. The blades are connected to an adjustment rod that has two nuts on the end—the outermost nut is called the jam nut, and the innermost nut is the adjustment nut. Start by positioning the blades so that they run from side to side. Use a ruler to measure the current height of the blades. Then, loosen the jam nut in order to access the adjustment nut. Turn the adjustment nut counterclockwise to lower the cutting deck, or turn it clockwise to raise it. Re-measure the blades, and then repeat on the other side to even out the cutting deck height if needed. When you're satisfied with the height of the blades and have confirmed that they are even, use a second wrench to hold the adjustment nut in place while you re-tighten the jam nut.